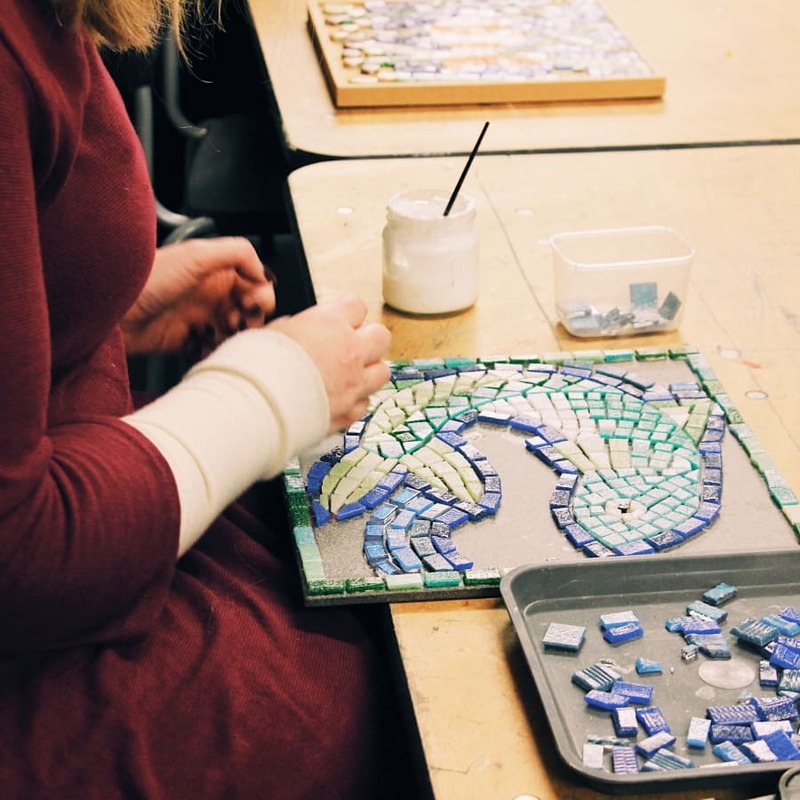 HomeAll classesArtPottery And MosaicsAll levels Mosaic Classes! With 20 years’ experience, Art4Space will inspire you to explore your creativity in a gorgeous relaxed studio. Cover the basics as well as advanced techniques. The classes are run by artists with over 20 years experience who have an amazing passion for their art forms. The artists will inspire you to explore your creativity in a relaxed learning environment. These classes cover the basics as well as more advanced techniques – dive in at whatever level suits you! For drop-ins you create a mosaic tile to take home. The studio shelves are full of treasure for you to use. One of the best stocked mosaic studios in London. The range is unbelievable. 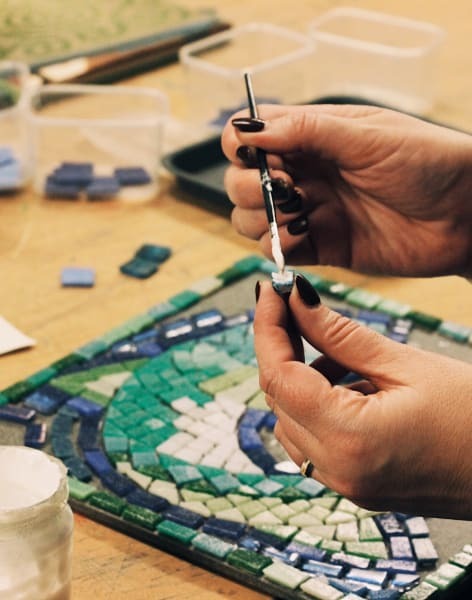 You will be introduced to the fundamentals of mosaic which can allow you to progress onto further projects, e.g a mosaic art piece, plant pot, mirror frame, table top - we have all the bases for you to choose. Previous participants' feedback: “The class is brilliant, I keep coming back!" 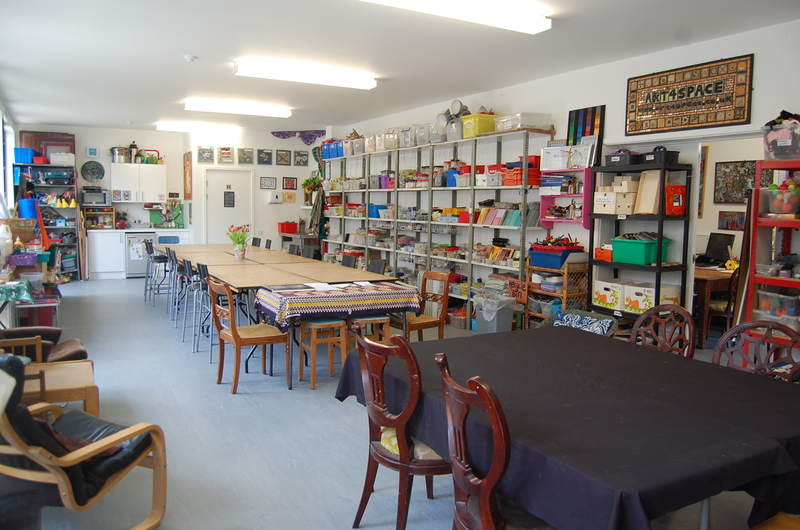 "The tutors are superb, they have so much knowledge and nothing is too much trouble" "As soon as you walk into this space you feel welcome, a few of us were here for a one-off class. You all sit around big tables and get inspired by each other. Some folks were on the longer courses. Either way it all works!" "This is me time, straight from the office and into the most creative welcoming space. I have just enrolled on a 5 week course for more of this magic time!" We run this class every Tuesday and Thursday as a drop-in class, but we also run a 5 week course for £120 or a 10 week course for £230. If you can't make 5 or 10 consecutive weeks that's no problem as we have a ticking system so you won't miss out on your sessions! We are proudly one of Obby Top Teachers! In 2016 we created London's longest mosaic in Stockwell and in 2018 we completed London's largest school mosaic in East London! I loved this experience. The people were lovely, the atmosphere was relaxed and I really enjoyed making a mosaic. I would like to go back soon! Really enjoyed my mosaic taster session. Lots of choice and really helpful guidance meant that I left with a mosaic that I’m really happy with. The session was run alongside the longer 5 or 10 week classes so was nice to see what is achievable with a bit more time/expertise. I have been first time in mosaic class. Very good and friendly atmosphere. Glass of wine and I started create my own mosaic. I am absolutely relaxed and forgot about my problems. I liked class. It was really good experience to feell your talants. Good fun and a great class. It felt a little rushed at the end to get everything finished but I enjoyed my time. The class was relaxed and I feel that I received a perfect amount of direction - not helicopter teaching but there was help if needed. I'm pleased with my tile! This was a fantastic workshop for me, a complete beginner! The teacher was great, really enthusiastic and interested in what we were making. The environment was relaxed and welcoming. I learned a lot of valuable techniques and skills in a really short amount of time. Highly recommend to anyone interested in making their own mosaic tile. My friend and I really enjoyed the workshop. The teacher was great, really enthusiastic and interested in what we were making. She was kind enough to stay back an extra 30-40 minutes after the class, so that we could complete our mosaic tile. I will definitely recommend this class! 5 star from me! An excellent class where I made two mosaic tiles. There in an amazing array of glass and ceramics to cut and make your design. I haven't got round to grouting them yet but am confident that I will achieve a great result. This class was my introduction to Mosaic and I can say that it was more than I expected. Studio is wonderful and easy to find. In the studio there were thoughtful snacks and drinks. I very much enjoyed making mosaic and the class was quiet therapeutic. I will be back and I will be recommending this class to others. I enjoyed so much coming every Thursday to hang out with the group and to discover the artsy part of me that I never though I had on me. So, yes, I'd recommend it to anyone! Good intro to cutting tiles and glass, and flexible approach from the tutors, who are artists so have a hood eye for creating stuff. The only thing I think they missed was safety info; they seemed to not be very into the idea of people wearing protective glasses and didn't let anyone know where the first aid kit was; a few people had minor cuts and I felt they were slightly too relaxed about the health and safety aspects - there were no serious injuries but it would be really easy for a bit of glass shoots into someones eye in this environment. An absolutely wonderful experience all round. A fantastic environment, warm welcome and very well organised. Enough instruction to safely get started and proactive encouragement and help to ensure we all got a really nice result to take home. Materials were plentiful, the atmosphere was supportive and enthusiastic - I didn’t want to leave!100% recommend and also an very chuffed with my mosaic tile! Great session. Learned how to cut tiles for mosaic making, and then had time to make own design on a tile, well supported by the teacher, and with plenty of colourful and beautiful resources available. Finished it at home - am so excited - it looks great ! Thanks for this experience ! Did the taster mosaic and tile making class and it was so much fun! Everyone was super friendly, the people doing the longer courses are also there and you get to see the cool stuff they have been doing which is quite encouraging.! Eli the teacher is a total vibe, making you feel comfortable to explore your creativity yet guiding you when needed without feeling like you’re an outcast as it’s your first time. Thouroughly enjoyed it and will definitely be back. Thank you!! I really enjoyed this mosaic class. There was a friendly atmosphere and the session was well facilitated. It was my first time trying mosaic making but still managed to go home with a lovely handmade gift that I was really pleased with! It was a fun evening! An enjoyable and supported first time mosaic experience. There is an abundance of materials to choose from and be creative with. Great to see the different projects being worked on in the class. I plan to return to complete a larger mosaic/tile project. I really enjoyed the class, and I'm really pleased with the mosaic tile I made! The course leader was encouraging and helpful, with just the right amount of tuition to get us started. I was also able to use some shells I'd brought with me. I'd hoped to make a photo frame but a mosaic tile was the only option - I didn't mind, so I didn't feel the need to ask if we could make any other item. There were plenty of materials and colours available, with books for inspiration. It helped to have an idea of the colours and design I wanted to make beforehand. The glass of wine and snacks were a bonus and the venue is great. It's worth noting that there's not time to grout your design (and you'd want the glue to dry beforehand anyway) so you are given a little grouting kit to do it at home. Amazing class, great teacher and very lovely and creative atmosphere, I loved it! fun class, lovely teacher, very pleased with the result! Would recommend this class. Venue is nice too. Really enjoyed the class. Something a little different to my usual Tuesday evening! Lots of different types of tiles and colours to work with and the teacher was great! I enjoyed this class & love my mosaic tile. I was a bit rushed at the end but the tutor helped me finish my piece. At times could've done with a bit more direction. It was a lovely setting and so many bits of glass and ceramics to choose from and lots of inspiring pieces around the place! This was a great taster session at the right level for a total beginner. An amazing treasure trove of tiles and trinkets to use. Really enjoyable. Had a great time yesterday! Variety of tiles, mosaics and china to choose from. Also the studio env is very nice. Great way to spend a couple of creative hours. Highly recommended! Nice relaxed atmosphere, an enjoyable evening making mosaics! Very clear instructions and you can get stuck in straight away. It was nice to walk away with a completed piece (you do have to grout the tile at home but this is quite straight forward). A glass of wine and some nibbles were provided which was a nice touch. The class was very good! I learnt how to cut tiles, plan a design and then glue the tiles together. I got a kit to take home and grout my piece with, then it’s all ready! I wish there was a continuation class! Really relaxing and enjoyable, great teacher! Class was very good and leaned what I wanted would recommend to friends the teacher was very good and exlpaned all the way . what a relaxing experience!Friendly and helpful tutors, huge amount of resources! I took my mum to the mosaics making class for a birthday present and we both had such a lovely evening. The teacher, Louise, was really friendly and enthusiastic, the studio is a beautiful inspiring space to create away an evening in. Hugely recommend! The class was a great chance to enjoy a creative evening in an informal setting. The Tuesday evening time and location were also ideal for a post-work crafting session. A brief explanation on cutting and mosaic-ing was given, and we were then free to design and create the mosaic tile as we wished. The class was well run, in a nice space and by a knowledgeable teacher. I would definitely recommend it for some chilled out creative time. Great way to unwind, friendly environment, wine and snacks provided too! It was so nice. I enjoy a lot. My first Mosaic time in my life. So many various tile I can use. Many different colours. I have some trouble find here with City mapper. But I enjoyed class! I booked this class with a work friend and we went in totally open minded with no expectations. We were welcomed so warmly (on a freezing cold Thurs evening) by Natalie who was super friendly and offered us some drinks while we settled into our space. The introduction was so informing, easy-to-grasp and perfectly timed. We were able to get stuck in right away which was great! Natty explained the use of the tools and different types of tiles very well while reminding us of safety. We worked on creating different shapes and she assisted each one of us individually when we got stuck (which was often) and totally made us at ease when we got frustrated trying to get it right. We got to design our own tile with mosaic using our own ideas. Natty was so sweet to stay behind way past the finishing time to let us complete our mosaic and she helped us complete it to ensure we left with a complete piece as well as giving us the grout to fill in at home with full instructions. Hands down I would recommend this to anyone who wants to have a bit of fun while doing something relaxing especially after a long day at work... 11 out of 10 from me! What a great set-up! I went with a friend to the one off evening workshop. We have both come away with beautiful tiles. You are supplied with a glass of wine or a soft drink for the evening and the choice of decorative chips to break up and decorate your tile with is huge. Really loved it. Everyone was so friendly and welcoming. We had a lovely glass of wine, snacks and the opportunity to explore books/mosaics to get ideas before making our own. We were able to practise, so that we felt confident when coming to mosaic our own tile. Had a great time - really good instruction and made a lovely mosaic! The class was sublime! This was my first experience of mosaics and there were others there who had been before and were working on their pieces. Natty, our tutor, was patient, knowledgable, very encouraging and had great snacks! 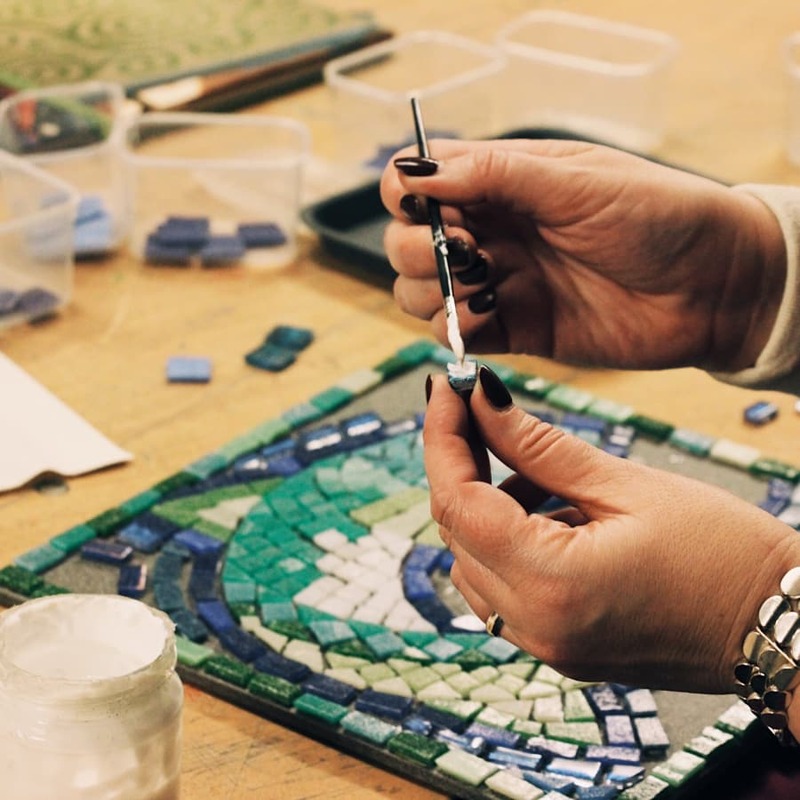 The workshop was a veritable feast for the eyes with plenty of inspiration from the many mosaics displayed and the seemingly never ending supply of tiles in every single colour you could imagine. Natty’s instructions were easy to follow and she was on hand all the time. She has great energy. I came away with my own masterpiece. A great class pitched perfectly for all abilities. Great class! Really well organised and an excellent introduction to mosaics. Would highly recommend. Art4Space has over 20 years experience with mosaic and the creative industry. They have secured over 350 commissions including The Shard, Silver at Royal Hampton Court Show, Leytonstone Tube Station, London's longest mosaic and London largest school mosaic. You will be taught by one of the directors or leading artist (Jewels, Eli, Louise, Natti and Leah). We Art4Space is an award winning not-for-profit social enterprise founded and run by professional artists. They put visual art at the center of everything they do, connect and enhance communities and inspire individuals through creativity. All materials included in the cost. Refreshments provided (Including a glass of vino if desired! ).